Optical Surfaces Ltd has developed a 600mm Fizeau interferometer enabling it to now offer quality testing of flats in a single aperture up to 600mm in diameter. This is a capability that only a few optical testing and manufacturing centres around the world possess. 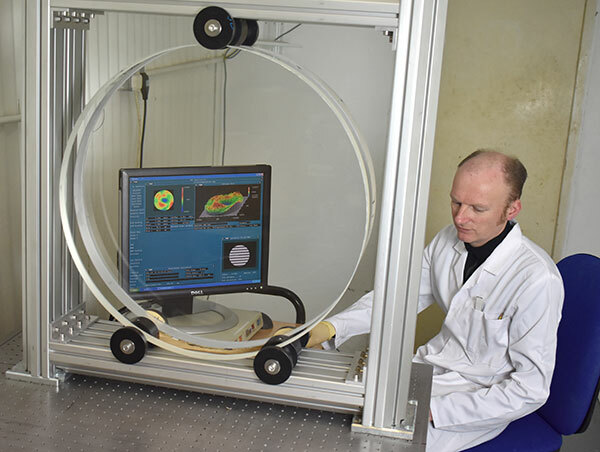 Housed in an ultra-stable testing environment, this interferometric set-up will allow direct qualification of larger flat mirrors up to 600mm diameter by testing them directly over their complete aperture without the need to use time-consuming combination methods. This new capability increases confidence in measurement accuracy and data analysis while minimising potential errors and the time taken to complete the quality testing. As a producer of ultra-high precision optics and optical systems for over 50 years, Optical Surfaces is acknowledged as a leading manufacturer of large, high precision reference / transmission flats and mirrors (coated flats) to research establishments, national standards laboratories and organisations worldwide. This is now complimented by the new interferometric testing facility, which will enable Optical Surfaces to reliably provide even more accurate test data on its reference and transmission flats up to 600mm (24 inches) in diameter. The company’s ISO 9001-2008 approved manufacturing workshops and test facilities are deep underground in a series of tunnels excavated in solid chalk. This provides an environment where temperature is naturally stable and vibration is extremely low. With such stable conditions testing, particularly with long path lengths, becomes quantifiable and reliable. Working with highly-stable technical materials such as, Fused Quartz and Zerodur, Optical Surfaces is able to routinely achieve a surface accuracy of better than lambda/20 p.v. and surface roughness of less than 1nm on reference and transmission flats up to 600mm in diameter. In addition to standard flats, Optical Surfaces offers special options for non-circular shaped flats, higher surface accuracy / quality, precision mounts, light-weighted options and an extensive range of coatings for demanding applications. All reference flats from Optical Surfaces Ltd. come with full quality testing assurance. For further information contact Optical Surfaces Ltd. on +44-208-668-6126 / sales@optisurf.com.